I was taking a walk in the woods the other day when I heard an unfamiliar screeching sound from up above. It was loud and very unmelodic. It sounded like an animal in distress. I looked up to try to pinpoint the source of the screeching. I didn’t have much hope in finding the source because I had heard birdsong during the entire walk up to that point and hadn’t been able find a single bird with the woods and leaves so thick. But the source, as it turned out, was very easy to find. It was a Barred Owl family high in a tree. Two youngsters and an adult in one tree and another adult in an adjacent tree. Even through the thick leaves, the size of the owls gave away their whereabouts. Knowing that owls are easily disturbed I didn’t venture off the trail. I didn’t have to as they were perched in a tree right near the trail. I snapped a few photos in the tricky lighting and moved along. I was happy to have seen the owls. I typically have poor luck finding owls, but the screeching led me right to them. The source was one of the youngsters calling for a parent. Later in the walk I heard in the distance the more familiar “Who cooks for you? Who cooks for you aaaallll?” song of the adult. Barred Owls can be active during day and night. They are not strictly nocturnal like many owls. It was a nice surprise and certainly the highlight of the pleasant walk. 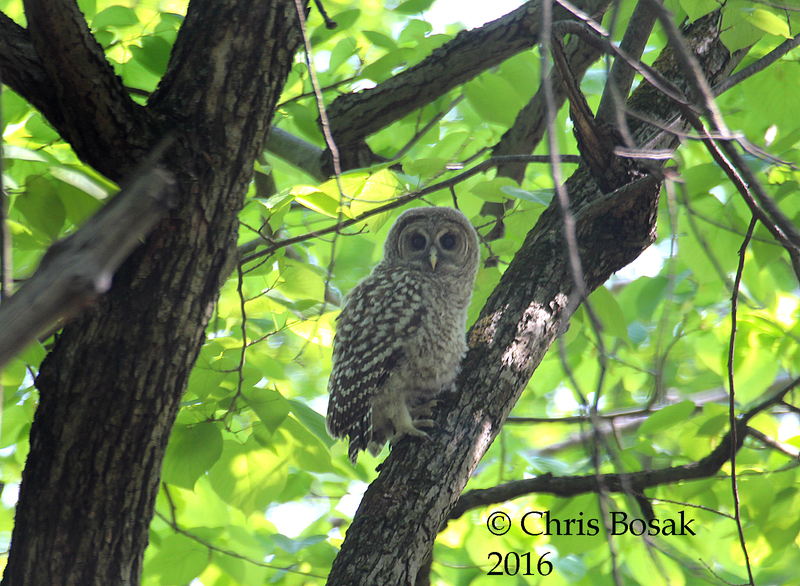 A young Barred Owl rests on a branch in Danbury, Conn., spring 2016. A Barred Owl looks down from a dead tree in Danbury, Conn., spring 2016. 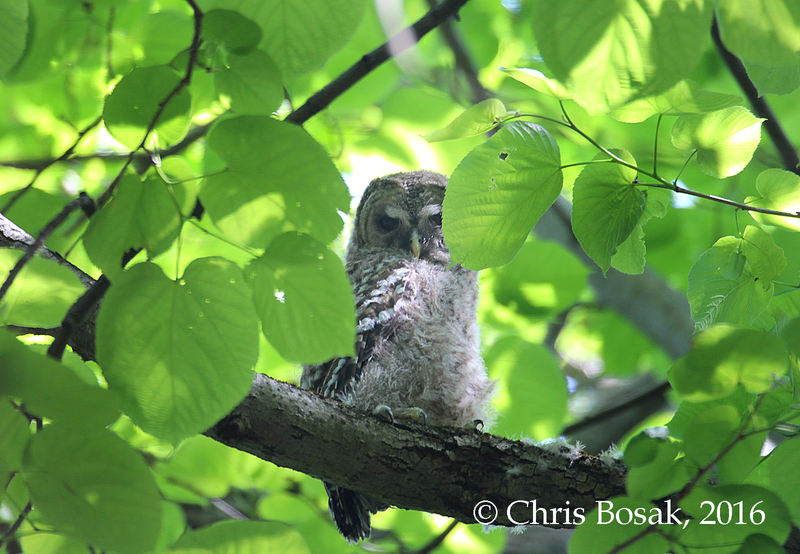 This entry was posted in Birds of Prey, Owls by Chris Bosak. Bookmark the permalink. 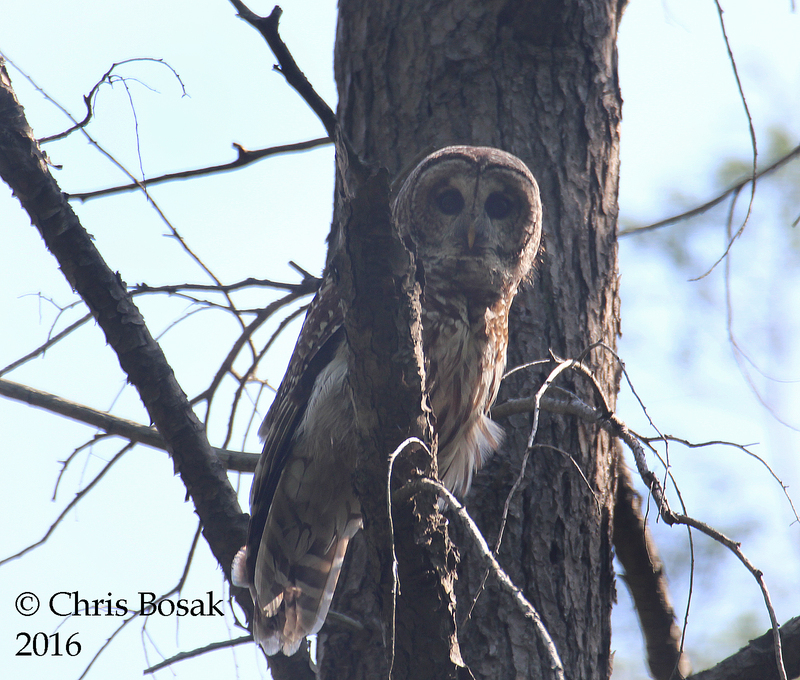 Saw you Barred Owl this morning in the deep woods at Tarrywille! Is that where YOU saw this fellow? Sorry for not getting back until now. I was close to Tarrywile, but more toward Ridgefield on the Ives Trail.